As dead people go, Joseph Riel wasn’t even all that interesting to me. He was just an in-law, the husband of my great-great-great-grandaunt, Gertrude Wagner Riel. He was not even a blood relative, much less a direct-line ancestor, and he and Gertrude died without issue, so I cannot hope to find Riel cousins among my DNA matches. And yet it was Joseph Riel’s grave marker that gave me the final clue to the German place of origin of my Wagner family. Before I explain what was on the grave marker and why it mattered, let me introduce you to my Wagners and summarize the evidence for their place of origin in Germany up to this point. Further digging revealed that Henry (Jr.)’s parents, Henry and Mary (née Nau) Wagner also immigrated. The family can be seen in the 1860 census (Figure 3), living in Detroit.4 Henry himself was already married by that time and living separately. Henry Wagner (Sr.) is noted to be a “gentleman”, born circa 1810 in Hessia, whose personal estate was valued at approximately $5,000. Mary, his wife, was also born circa 1810, and their sons John and August were born circa 1832 and 1834, respectively, and were both employed as carpenters. Son-in-law Joseph Riehl was noted to be a blacksmith and he and his wife, Gertrude, were both born about 1835. The manifest shows the family of Henry Wagner, a 50-year-old male farmer from Germany traveling to the U.S. Henry’s age suggests a birth year of 1803. The name of the passenger below him appears to be “Cath. ;” however, the passenger is marked as a 24-year-old male. No trace has yet been discovered in U.S. records for a Catherine Wagner born circa 1829 who belongs to this family, and “Catherine’s” birth year is approximately correct for Henry Wagner (Jr.) who is missing from this manifest. This suggests one of two possibilities: either (a) Henry Wagner (Jr.) immigrated separately from his family, which would explain his absence from this manifest, and Catherine Wagner is a real sibling for whom evidence may yet turn up in U.S. records with further digging, or (b) the name “Cath.” was recorded in error, and the 24-year-old male passenger listed with the Wagner family was actually Henry (Jr.). The names of the other passengers listed below “Cath.” — August, Johnny and Gertrude — are consistent with the known children of Henry (Sr.) and Mary Wagner, although their ages appear to be 20, 22 and 28 (? ), suggesting birth years of 1833, 1831, and 1825, which are a bit off from what was reported in the 1860 census. Interestingly, the family matriarch, Mary (née Nau) Wagner is not mentioned with the family group, although there is a good match for her at the bottom of the page — 50-year-old Marianne Wagner. Since she was separated from the family on the manifest, the possibility existed that perhaps Henry (Jr.) was similarly separated, perhaps on the next page after Marianne’s name. However, all pages of the manifest were checked and there was no match for a Henry Wagner of the appropriate age. According to this manifest, 27-year-old Henry Wagner was a German carpenter who was traveling to Buffalo, New York. His age suggests a birth year of 1827, and his occupation, carpenter, matches the occupation reported for John and August Wagner on the 1860 census. While I was excited to see his place of origin reported as “Fritzlar,” I recognized that this information would not help me unless I could be sure that the passenger described here is “my” Henry Wagner. And his destination, Buffalo, is somewhat problematic, since the Wagner family was not known to live in Buffalo. So although this could be the correct manifest, it’s also possible that this passenger was a different Henry Wagner, since the surname is so common. At this point, we have two hypotheses to evaluate: (a) this is the manifest for “my” Henry Wagner, and he stopped in Buffalo briefly before moving on to Detroit, or (b) this manifest is for a different Henry Wagner who traveled to Buffalo and remained there. If (b) is correct, we should expect to find evidence of a German immigrant named Henry Wagner who matches this passenger, living in Buffalo or thereabouts. Accordingly, census records for Buffalo, New York and adjacent counties were checked, and there is evidence of a Henry Wagner, born in Germany circa 1830, who arrived in the U.S. circa 1852 and lived in Clarence, New York, which would at that time have been farm country on the outskirts of Buffalo. This suggests that perhaps the Henry Wagner who arrived on the General Jacobi is not my Henry after all. So perhaps my Henry really did arrive with his family on the Erbpring Luidrich August in 1853 and was misrecorded as “Cath.”? I think it’s possible, maybe even likely. But with such a common name, we may never know for certain. All names in this record are written in Latin. Although the column headings are cut off in this image, the record indicates that Mary Wagner was born 10 July and baptized 15 July 1860, and that she was the daughter of Henry Wagner of “Roßen ChurHessen” and Catherine Granzinger of Oberelsau. Godparents were named as August Wagner and Maria Wagner, and they were probably the baby’s uncle and paternal grandmother. “Chur Hessen” in both these records is a reference to Kurhessen, properly called Kurfürstentum Hessen, the Electorate of Hesse, a German state which existed from 1814-1866, at which time its territory was annexed by Prussia. The territory was also known as Hesse-Cassel or Hesse-Kassel. Although the Meyers gazetteer does not reveal any places called “Roßen” that were located in this area, “Roßdorf” turns out to be a better clue, since there were two places by that name that were in Hesse-Cassel. One of these was located in Hanau County, about 2 km north of Bruchköbel, while the other was located in Kirchhain County, about 5 km southwest of Amöneburg. Based solely on this information, I had no way of knowing which Roßdorf was meant, so I put the Wagner research on the back burner. Of course, Meyer’s gazetteer identifies a second location called Mardorf that was in Kurhessen, in Homberg County. How can we be sure that Joseph Riel wasn’t from that Mardorf instead? Cluster research in genealogy (also known as FAN research, research which focuses on our ancestors’ Friends, Associates, and Neighbors) is based on the principle that our ancestors did not live their lives in a vacuum. One person in a village would decide to move and settle in a new area, and he would be followed by others from the same village — a phenomenon known as chain migration. So it’s more logical to suppose that the Riel and Wagner families were from the same part of Germany, and continued that association in Detroit, rather than supposing that they came from villages that were relatively far apart. While in Detroit, I also had the opportunity to attend Mass at Old St. Mary’s church — the parish to which my Wagner ancestors belonged. After Mass, I had the good fortune to chat with Randy Bowers, operations manager and archivist at the parish. He gave me a draft of a parish history by John D. Little which states, “In 1830 the first German immigrants — all Catholics and mostly farmers — arrived in Detroit from Neustadt, a small country town of about 2,100.”10 This statement offers further evidence that we’re on the right track in identifying the locations of Roßdorf and Mardorf, since the town of Neustadt can be seen on the map in Figure 8, about 22 km (13 miles) from Roßdorf. Although the evidence looks pretty good at this point, the identification of the Wagners’ ancestral village must be considered tentative until we find mention of them in the church records for Roßdorf. There is also a great deal more research that can be done to document the Wagners in Detroit, especially in church records. Unfortunately, I had no time during this visit to utilize the vast genealogical resources of the Burton Historical Collection at the Detroit Public Library, so that research remains on my to-do list for the time being. However, I’m fairly confident that I’m on the right track, since all the clues regarding place of origin for the Wagners and their FANs are pointing to the same location. Joseph Riel may have been just an in-law to my family, and it’s true that he left no descendants. But in retrospect, it turns out that he was a pretty interesting guy after all. 2 1900 U.S. Federal Census (population schedule), Detroit, Wayne, Michigan, E.D. 23, sheet 24B, John Wagner household, http://ancestry.com/, subscription database, accessed 3 November 2017. 3 Death Records, 1897-1920, Michigan Historical Center, Seeking Michigan (http://seekingmichigan.org), 1907, #735, certificate for Henry Wagner, died 6 February 1907 in Detroit, Wayne, Michigan. 4 1860 U.S. census (population schedule), 3rd Ward Detroit, Wayne, Michigan, page 173, Henry Wagner household, https://www.familysearch.org, accessed 3 November 2017. 5 New York, Passenger Lists, 1820-1957 (image and transcription), record for Henry, Cath., August, Johnny, Gertrude, and Marianne Wagner, S.S. Erbpring Luidrich August, arrived 29 September 1853 in New York, Microfilm Serial: M237, 1820-1897; Microfilm Roll: Roll 132; Line: 12; List Number: 1010, http://ancestry.com/, subscription database, accessed 3 November 2017. 6 New York, Passenger Lists, 1820-1957 (image and transcription), record for Henry Wagner, S.S. General Jacobi, arrived 3 May 1854 in New York, Microfilm Serial: M237, 1820-1897; Microfilm Roll: Roll 138; Line: 19; List Number: 406, http://ancestry.com/, subscription database, accessed 3 November 2017. 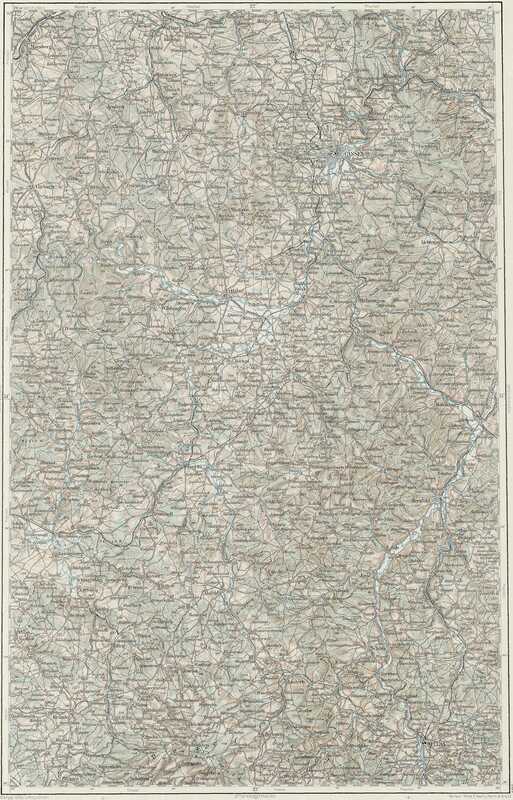 9 Map, “Kassel” circa 1906 from 3rd Military Mapping Survey of Austria-Hungary, Elte Department of Cartography and Geoinformatics, http://lazarus.elte.hu, accessed 4 November 2017. 10 John D. Little, The History of Old St. Mary’s, p. 4; photocopy to Julie Szczepankiewicz, Hopkinton, Massachusetts, 2017; original held by Randy Bowers, Detroit, Michigan.